After a year of major renovations in 2006, we are pleased to offer the finest of accommodation in our ‘Hillcrest Suite’. This lovely suite has a queen size bed, sitting area, a kitchen nook and a beautifully appointed four piece en suite with a romantic soaker tub for two. The basin is a hand hammered Mexican copper vessel set in an antique dresser. A kettle, coffee maker, small fridge and microwave are in the kitchen nook along with an iron and ironing board. Complimentary robes are available for your use. There is a roomy second bedroom next door that has two double futons. This second bedroom room can also be rented as additional accommodation for a larger group. Note: the second bedroom does not have its own bathroom so occupants must use the main B&B suite’s bathroom. The B&B has its own entrance for your privacy so you can come and go as you please. The inside of our home and the Hillcrest Suite are non-smoking areas. Contact us for rates for long stays. Your freshly prepared full breakfast is served in our dining room or weather permitting, out on the deck to take in the breathtaking views. 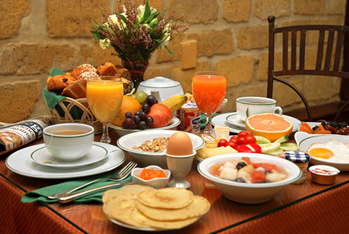 Your breakfast can include coffee, tea, juice, freshly baked muffins, yogurt and cereal and our own farm fresh eggs. Seasonal fruits and berries from the neighbouring farms may also grace the table. Special Dietary Requirements are No Problem! Please let us know if you have any special dietary requirements before your arrival. We wish to assure your complete satisfaction! 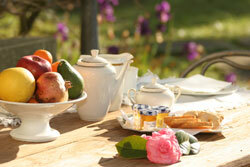 You will not leave the breakfast table hungry, as you start on your day of adventure in the beautiful Cowichan Valley! 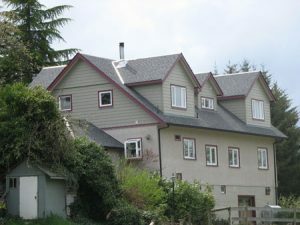 We are 30 minutes from Victoria and 40 Minutes from Nanaimo. Reserve now for your holiday in paradise!